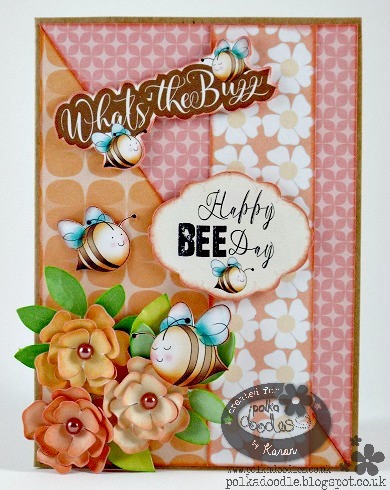 Ruth: I've used Winnie Fruit Punch for my shaped card - I layered the image onto the topper using a graphics programme (I did the same with the sentiment). I've added a line of liquid pearl dots around the edges of the card, a little bit of glitter plus some half pearls and the card is complete. Really quick and easy to make! 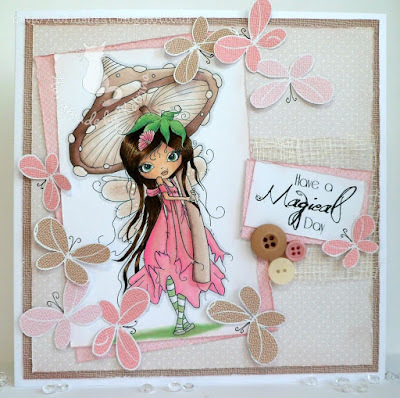 Anjie - I've used the fab new Little Kingdom collection that was on the show on Wednesday. The whirls and flourishes are on the fabulous toadstools and I have added some dried flowers as added flourishes to the little scene. LOTS more info and photos on my blog. 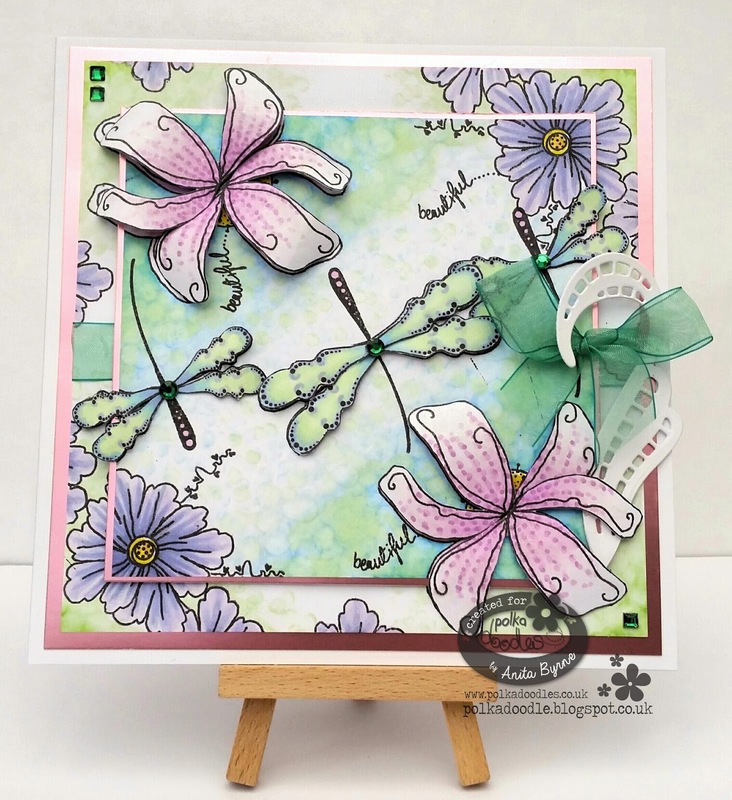 Anita - For this week I have used Lemonade Fizz Stamp Soup Collection which has created my main focal image of dragonflies and flowers, then made my own backing paper with these gorgeous stamps too. Added some sparkle with a zig pen. This could be die cut swirls or flourishes. in the paper, any part of your creation as long as it is included somewhere :-) You have until Noon GMT, Friday 6 May, to enter this challenge. 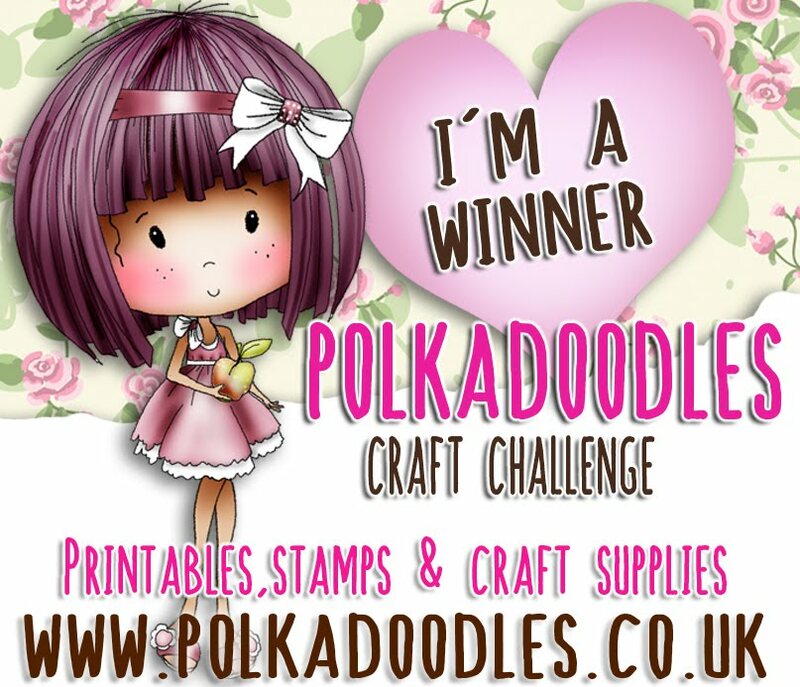 Our winner will receive a $10 gift voucher to the Polkadoodles Download Store. Jackie - For the Swirls and Flourishes challenge I have played with The Winnie Sprinkles Springtime Collection. I played around resizing flowers and butterflies from the CD and chose an image to print off. This was coloured using Copic markers - I have to say, I am really enjoying colouring Winnie! 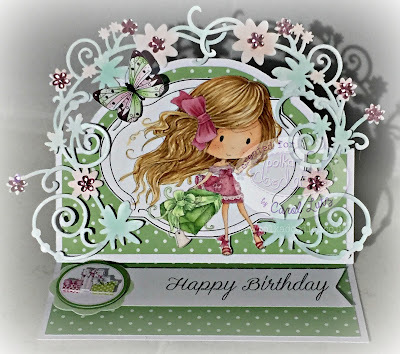 I added both die cut and crystal swirls and flourishes on the layers of my card. Ria - For the Swirls and Flourish challenge this week I used the gorgeous Eden Collection. I printed Eden Cherryblossom on Kraft and coloured her with alcohol markers and pencils. The swirls are from a die set. 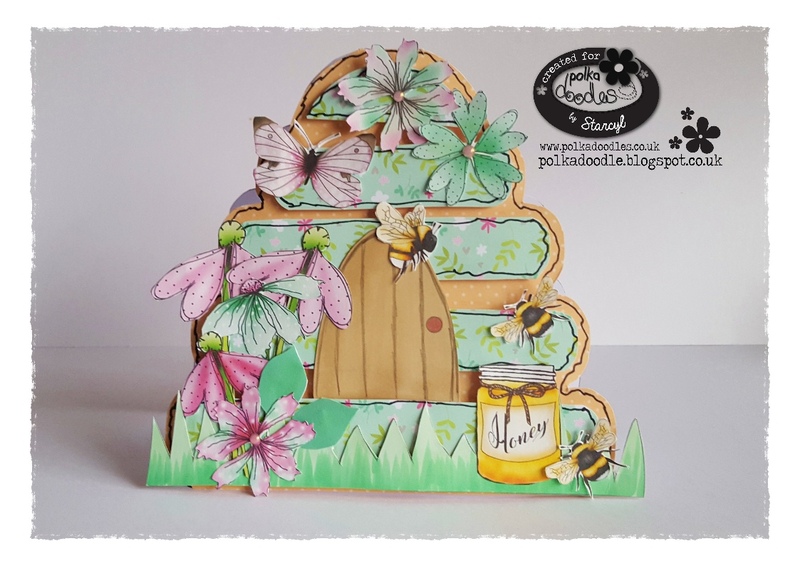 Carol - today I've made an easel card with a very cute frame featuring A Gift, a sentiment, butterfly and background paper from from the Winnie Fruit Punch collection. I printed all my elements on Copic Xpress-it cardstock and coloured my image with my Copics. The swirls are from a Couture creations die, which I tinted with Copics and embellished with flowers. Jenny - I've made a very simple card because it's for someone I work with and we don't go too elaborate for workmates. I have used Winnie Sugar Sprinkles and I really don't think she needs too much as the images are perfect to stand alone. Mia - This card is made using the gorgeous Winnie Sugar Sprinkles collection. All the papers, image and embellishments are from the collection. 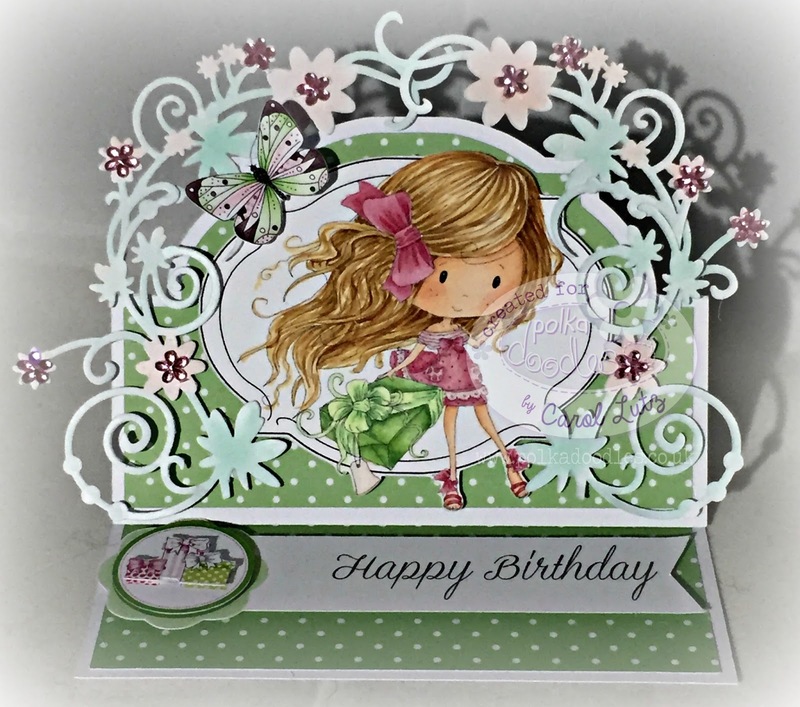 The swirls are from Joanna Sheen. For more details please visit my blog. 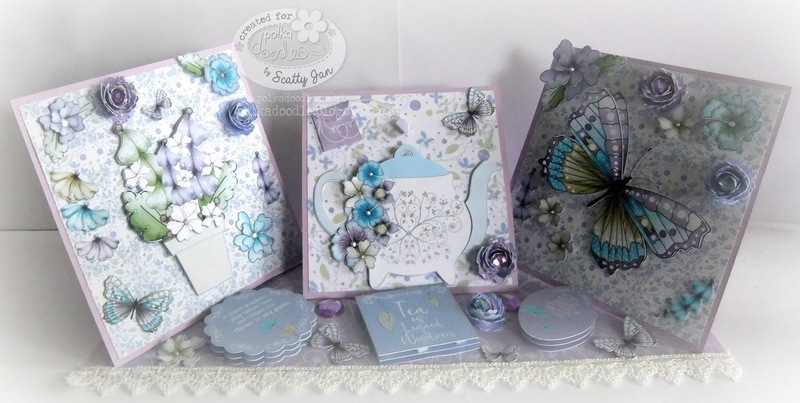 Karon - Ooh swirls and flourishessss :-) I have used the Lavender Tea Collection for my cards to day. I couldn't decide whether to give the front panel a scalloped circle or a rectangle so I did two cards :-) Which do you prefer? 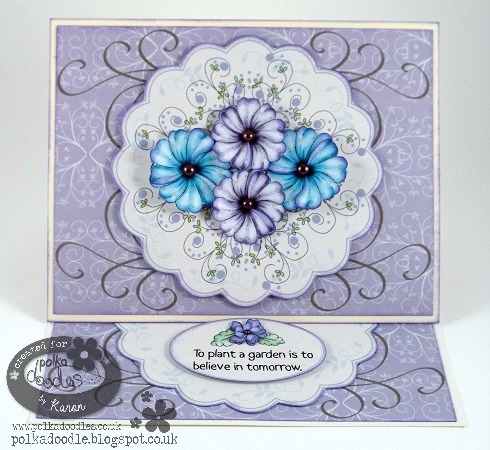 The darker flourish on the purple background is from the Lemonade Fizz Collection. I have inked all the edges of all the flowers and the layers. Wonderful inspiration from the Design Team, hope that gets your creative juices flowing. for using PD images (more details in the pages tab up top) will be announce next Friday. visit and appreciate you taking part in our challenges. Happy Friday! Middle of April already! 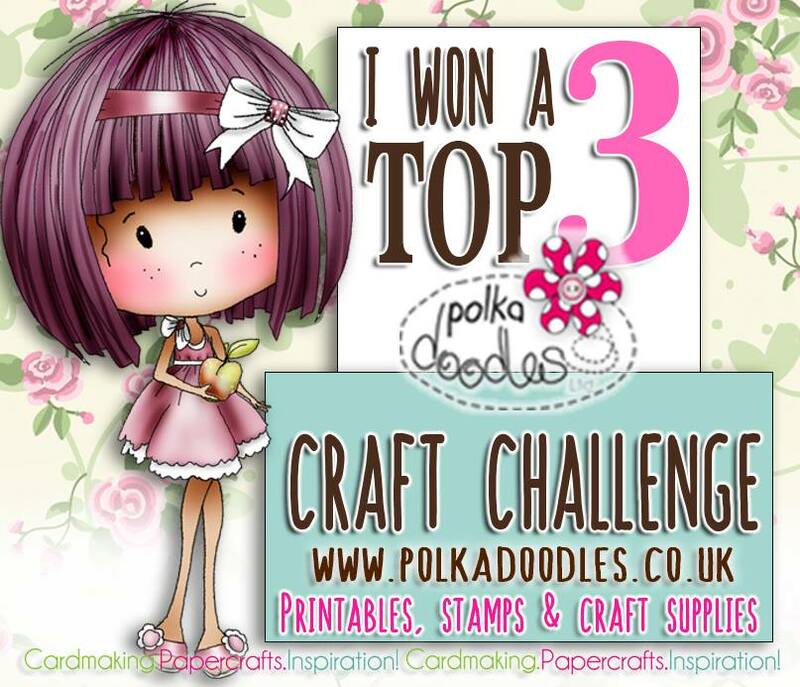 charms you name it, if it's a flower it counts :-) Remember, you do not need to use Polkadoodles products to enter our challenges. 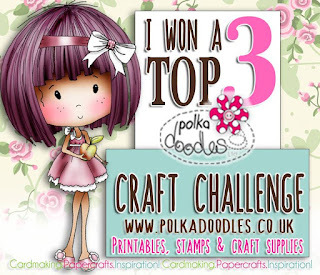 Only a few little rules and they are over there in the side bar -----> The Winner and Top 3 of our Cream & Sugar Challenge, along with our Top 3 Feathers for using a Polkadoodles image, will be announced at the bottom of this post. either as download or CD. Anyway's lets see what the fabulous Design Team have for your inspiration this week. Mia - I decided to make something a little more 3D for this week and used the flowers from the Winnie Fruit Punch CD and the leaves from the Winnie Sugar Sprinkles Springtime to upcycle these teacups I purchased cheaply from a charity shop. I love all the florals and characters on both CD's. 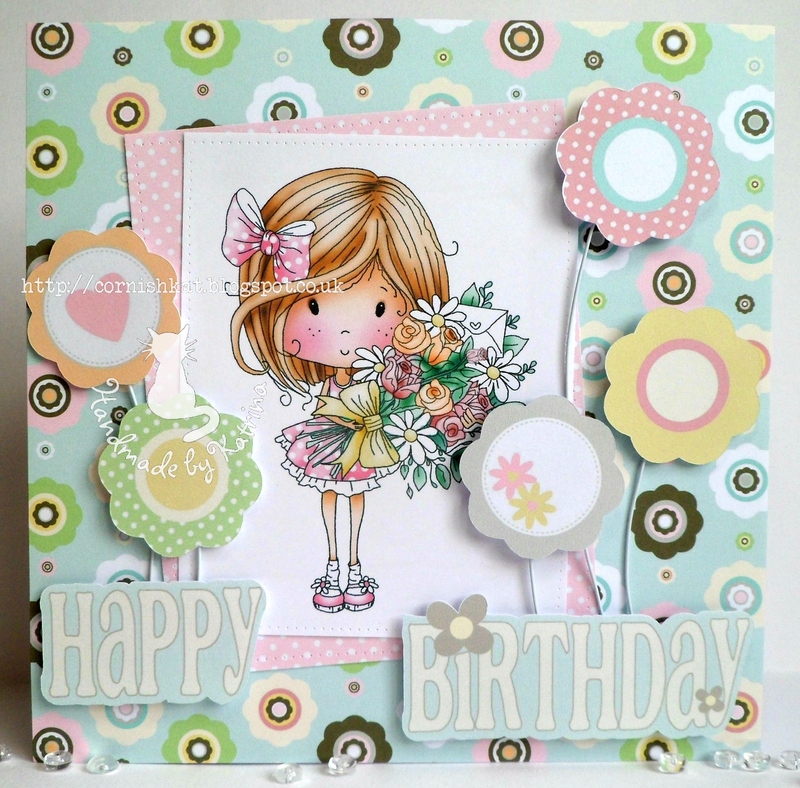 Jenny - For my Floral Frenzy I decided to take the easy way and use a template from the Lemonade Fizz collection. I printed a couple of sheets of backing paper and then printed the template onto the back, as my Cameo isn't plugged in at the moment I cut this out by hand. I took some of the embellishments into Craft Artist and filled a page with bees, flowers and a butterfly which I cut out by hand. Ria - For my Floral Frenzy I used the cute Winnie Fruit Punch collection. I used one of the pre-coloured toppers and added some stitching to it. Followed a sketch I found online as I love sketches :) it is so easy if you are out of ideas just Google card sketches and you will find instant MOJO :) I cut out the flowers by hand as that went faster then setting up the silhouette this time ;) happy weekend. Jackie - For my Floral Frenzy card I printed off some of the great papers, pre-coloured images and digi from the Winnie Sprinkles Springtime Collection. It was hard to choose what to print off first, everything's super scrummy!! I used a punch on the patterned paper for the strip in the background, and used foam tape to give some height to my flowers and depth to the butterfly. I coloured Winnie using Copic markers. Karon - I have use the delightful Winnie Fruit Punch for my card today. Using the fabulous fat bees and beautiful flowers. All the edges have been inked up, some foam tape was used to add some dimension. 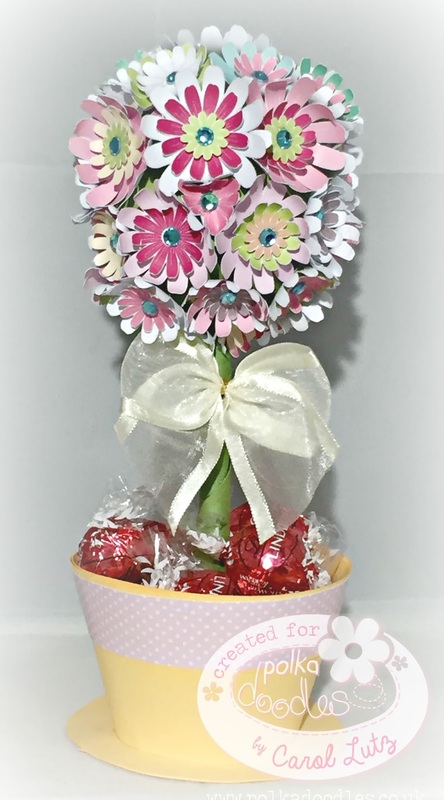 Carol here with a topiary tree featuring 3 printed sheets of daisies from Winnie Fruit Punch. I cut the flowers using my Cameo, shaped them and layered them and added a rhinestone centre. 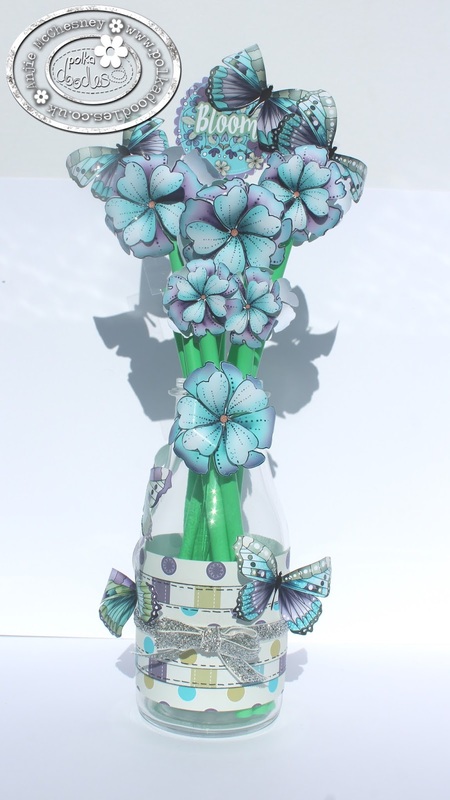 The base for the topiary came from the Silhouette store and I added a ribbon and filled the pot with chocolates. Here is your fabulous Top 3 badge for your blogs. Please add this wonderful badge to your blogs. You have until Noon, GMT, Friday 22nd April to enter this challenge. Did you enjoy the launch party over last weekend? 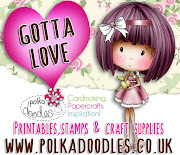 You can buy individual digi stamps to colour, design sheets to print and cut, even smaller bundles to work with. Of course you could also buy the whole collection bundle either as CD or download. Ruth: I've used the very lovely Winnie Fruit Punch cd - I added one of the sentiments to the front of the topper, enlarged it then printed onto thick white card then cut out individual flowers to add around the edges, finishing the card off with half pearls and liquid pearls around the edge. 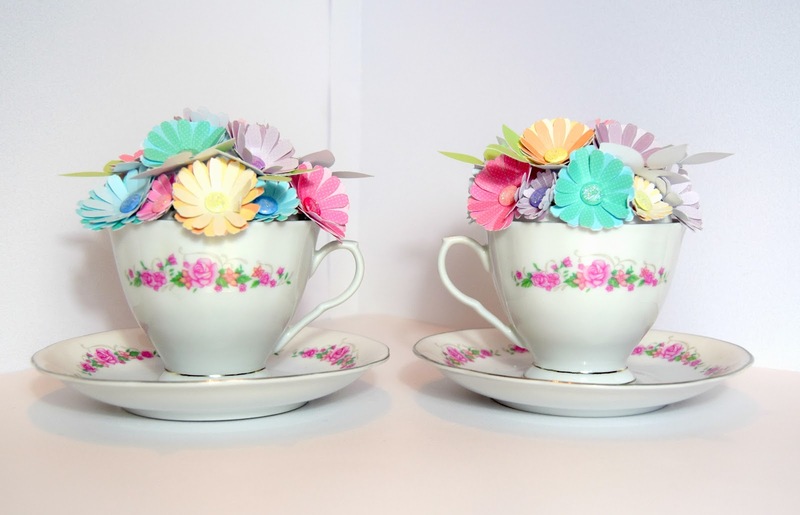 Anjie - I have used the fabulous Lavender Tea download collection on my make. 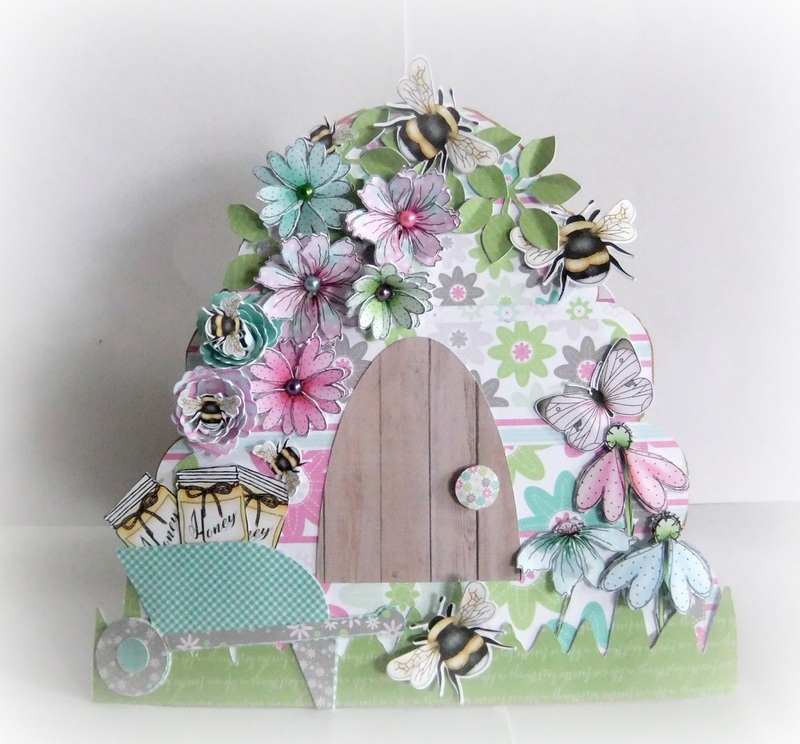 I've used lots and lots of flowers and butterflies and 2 word toppers. I've put them back to back on some straws so they look like flower stems. I've then wrapped some papers around the bottom of the bottle and added some ribbon. More details and photos on my blog. 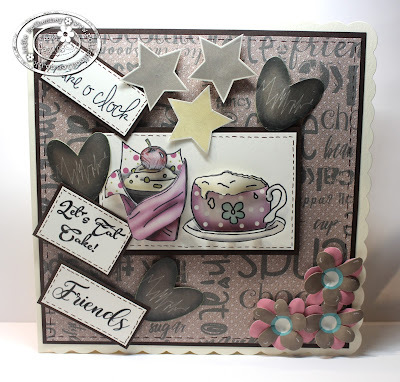 Lou: I have used the Lavender Tea soup stamp set to create my card. 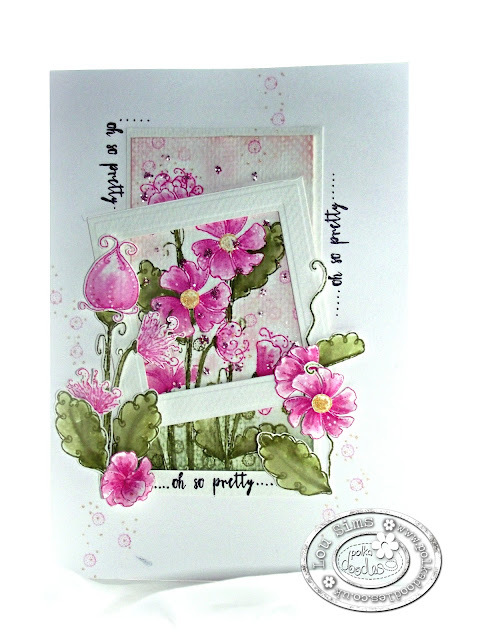 All the flowers have been stamped and coloured with distress inks. I created the centre panel, framed it and added additional flowers to the side. The sentiment is from the same set too. More close up photos can be found on my blog. 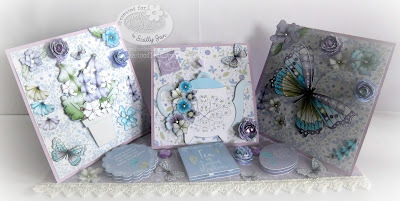 Anita- I challenged myself to use the yummy Lavender Tea Stamp soup so everything you see on my make is done using this awesome set, Backing papers were from the co-ordinating Lavender Tea Printable's Download sentiment was from the Twiggy & Toots Download collection. Bev here with my take on floral frenzy. 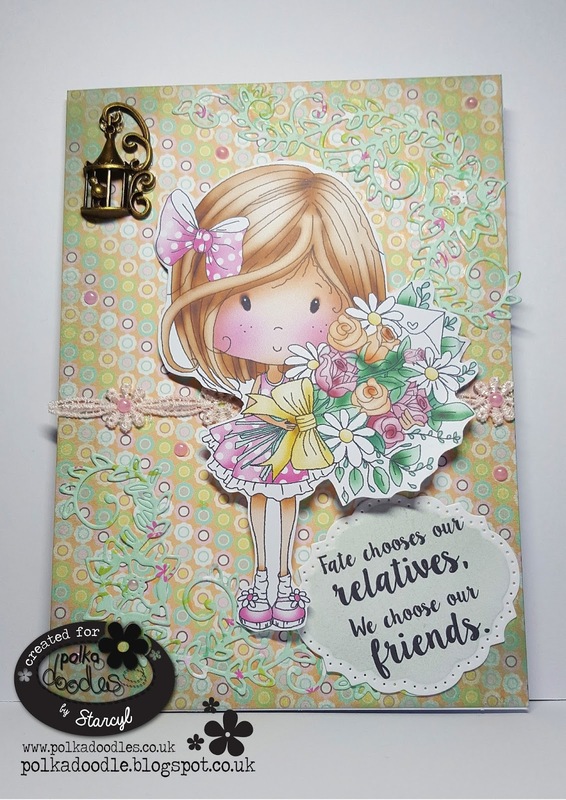 I used 'a lot' of the floral printed sheets from Lavender Tea, Cut, inked, shaped and layered up then placed around the beautiful sentiment which is also from the collection. 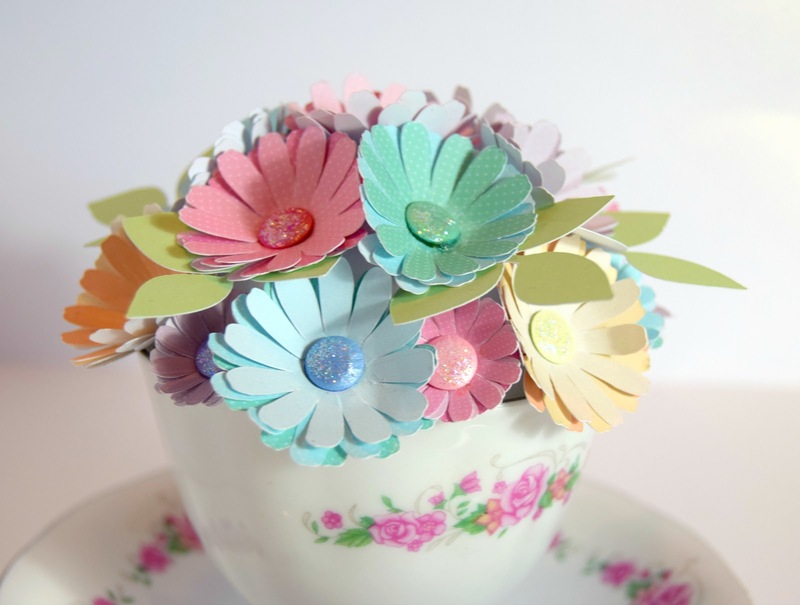 Beautiful creations to inspire you all with your floral challenge! WOW!! 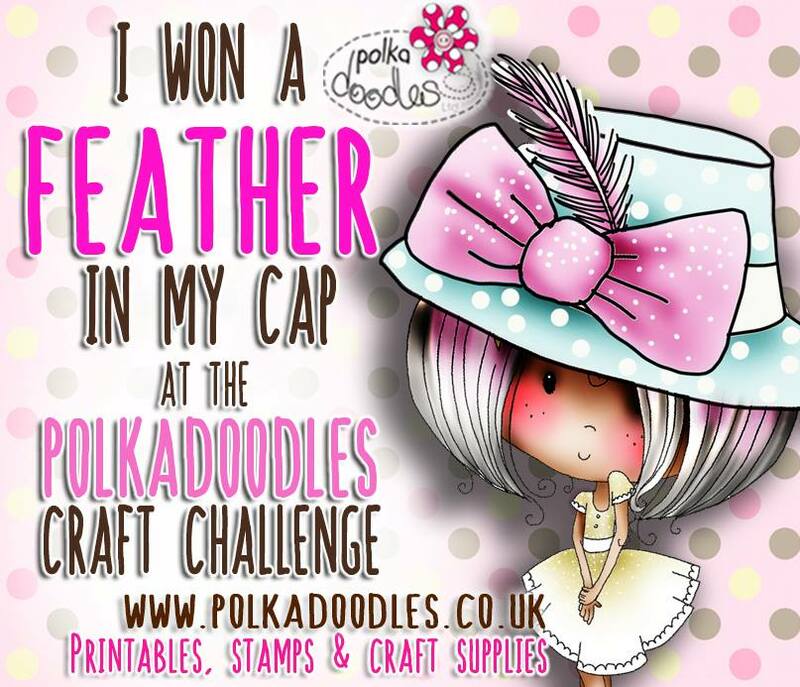 Our winners of our Cream & Sugar challenge and our Feather in my Cap winners for using PD images (more details on this up top in the tabs section), will be announced next Friday. So lovely creams, ivories, coffee and pink colours. You have until Noon, GMT, Friday 8th April to enter. 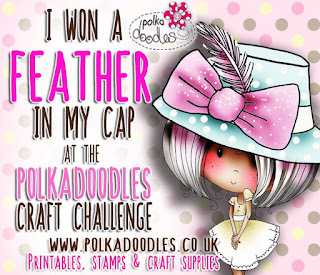 Basically we will be awarding Special Feathers to our favourite Top 3 entries that use a Polkadoodles image and you will be entered onto the Feathery League Board - this is so much fun, so check out the RULES on the tab at the top of the page HERE - you even get a Feathery badge if you're awarded a feather! You can find our first feather winners at the end of this post! Ruth: I've used the wonderful Twiggy and Toots collection for my card - all the papers and the pre coloured image (great for when you're in a rush!) are from the cd. Ribbons and charm are from my stash and I've added some blue to the theme because my coffee is usually cold by the time I remember I have it!! 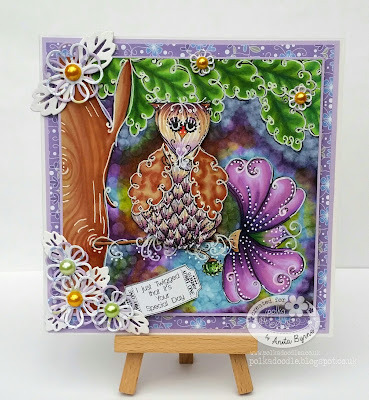 Katrina: I've used the gorgeous Octavia Moonfly CD for my card. I printed off the black & white version of 'Wistful' and coloured her in with alchohol markers. The sentiment and papers are all from the CD though I did adjust the colour on the dotty paper to make it cream coloured. The butterflies were cut from another of the papers and I drew on the antennae with a fineliner pen. Anita- hi there this week for our challenge I coloured my first ever colouring page from the Florabunda colouring Cd Rom, I coloured this page with pencils and used up my Polkadoodles off cuts of papers from my last project . Claire C I've been playing with some of the gorgeous 'Stamp Soup' stamps to make this card. 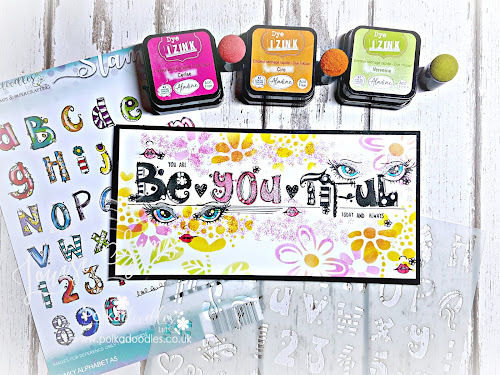 The stamps I've used are from Lavender Tea and Lemonade Fizz, coloured with my Lyra Pencils. The wings of the dragonflies were stamped onto vellum. Anjie - Of course the new Work and Play 12 collection is perfect for this challenge. I have used the coffee section but not used one of the Barista character images. I put the cup cake and the coffee together to make a topper out of them. More info and photos on my blog. 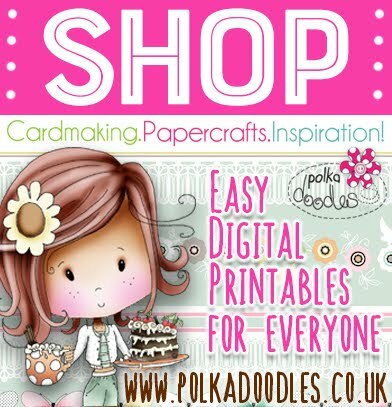 Please email us at sales@polkadoodles.co.uk quoting PD13001wk10 to claim your prize of $10 worth of downloads from the digi store! Well done Feathery friends! You have all been added to the league board with our first Feathers - so now you can put a Feather in Your Cap and use our Feather badge on your blogs! 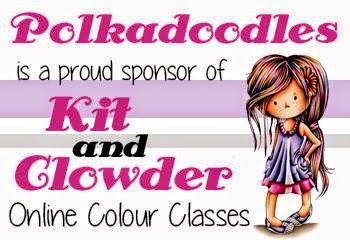 Each week the league board will be updated so we can all keep track and at the end of the season our Winning Featherist will receive a special Polkadoodles prize! Congratulations everyone! Don't forget your winners badges .